The rank of the products for hair care has been developed based partly on the most modern active ingredients intended for protection, nourishment and a better look of hair, and partly on fine tensides used in hair cosmetics. The most effective agent in all these products is panthenol which is contained in a biologically active concentration – shampoos contain 3 % and conditioners contain 4 % of panthenol. The provitamin B5 is necessary for beautiful hair. PantheHair® shampoo for normal hair contains 3 % of panthenol that is beneficial for the hair. The use of the shampoo will result in beautiful and fine hair. 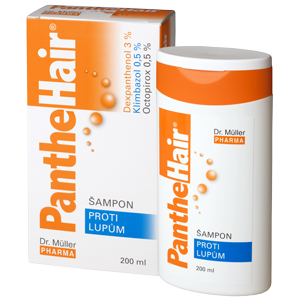 PantheHair® shampoo for greasy hair contains 3 % of panthenol that is beneficial for the hair. The use of the shampoo will result in beautiful and fine hair. Use: Apply the shampoo on wet hair and massage particularly the skin of the scalp until foam is formed. Let the shampoo act for some time. Then wash your hair thoroughly. PantheHair® Shampoo for Damaged Hair contains 3 % of panthenol which is beneficial for the hair. The use of the shampoo will make your hair beautiful and fine. PantheHair® Antidandruff Shampoo contains in addition 3 % of panthenol also efficient concentrations of two active substances – climbazole and octopirox (piroctone olamine) that use different mechanisms of action to fight against dandruff agents. 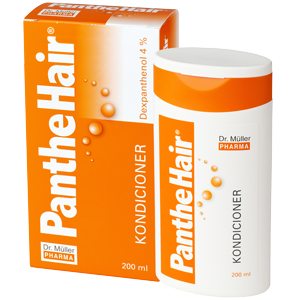 PantheHair® conditioner for easy combing contains 4 % of panthenol and orange wax. Regular use of this conditioner results in fine, shiny, easy-to-style hair. Use: Apply sufficient amount of the conditioner on wet hair washed by the shampoo. Let the conditioner act for some time. Then wash by water.